Download Free jQuery #Social Share, #Social Button, and other social media related plugins at our jQuery Social Media Section. Page 10 . Popular Social Networks: #Facebook, #Twitter, #Google Plus, #Pinterest, #Instagram. 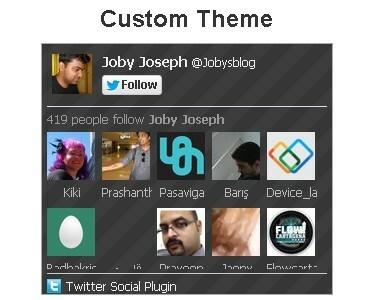 Today we're going to create a Facebook-like Twitter Follower Box using jQuery. Facebook Like box is very popular, however, by default Twitter doesn't provide such plugin. But this can be done using this plugin. tweed is a simple jQuery Plugin that allows you to display a simple feed of recent tweets on your pages. floatShare is a jQuery plugin which allows you to add Floating Social Share Area on your webpages.